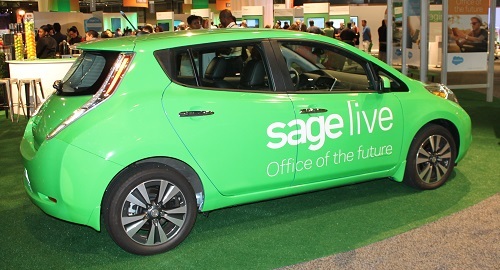 NEW ORLEANS – The fruits of the strategic partnership between Sage Plc and Salesforce.com Corp. were unveiled last week at the annual Sage Summit user conference with Sage Live, which the companies promise will “revolutionize” the way small businesses approach accounting. Built on the Salesforce1 platform and therefore living in the cloud, Sage Live can be accessed from a PC, tablet or smartphone aims to provide an integrated view of front and back office operations, backed by a multi-country accounting engine. It’s designed to give both accountants and business people a single view of the business, and replace SMB offerings such as QuickBooks. APIs and apps can bring in data from other sources, and apps are available for customizations and to meet specific business and vertical needs. “We want to smash down the walls between the front and back office to create a single office, where everyone has a 360 degree view of what’s important to your business to be successful,” Sage CEO Stephen Kelly told attendees. Salesforce president Keith Block addressed Sage Summit by video conference to underscore the importance of the partnership to the company. Kelly also called it a key partnership for Sage. While Sage Live is now available in the U.S. and U.K., it’s not in Canada yet. In an interview, Nancy Harris, Sage’s executive vice-president and managing director for Canada, said it will be available North of the border soon. Sage was late to the cloud game, which led some potential cloud customers to turn to competitors such as Netsuite. With the launch last week of Sage X3 cloud edition, all of Sage’s major offerings are available either on premise or in the cloud, and Harris said Sage Live is where the company will lap its competition.